A team of researchers under historical climatologist Joëlle Gergis has published a new article in the Journal of Climate that uses data from tree rings, ice cores, coral and 24 other natural indicators to reconstruct a millennium of Australian climatic history. The study, the Australasian region’s contribution to the fifth IPCC assessment report, collects and synthesizes the work of more than 30 scholars, conducted over many decades. Although plentiful records of past climatic fluctuations are available for the Northern Hemisphere over the past two millennia, the limited availability of long proxy records for the Southern Hemisphere has undermined attempts at global reconstructions. Uncertainty continues to surround how periods of prolonged warmth or cold, like the Medieval Climatic Anomaly (MCA, also called the Medieval Warm Period) or Little Ice Age (LIA), were expressed globally. Australian researchers have now revealed that a warmer climatic regime peaked in Australia just after its maximum in Europe, while demonstrating that Australia also experienced the cool weather of the Little Ice Age, even if its coldest periods were felt in different decades. 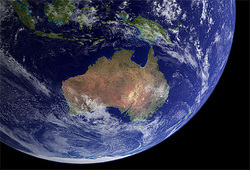 The Australian record is part of the Past Global Changes Regional 2K (PAGES) initiative, which endeavours to reconstruct the past 2000 years of climatic fluctuation in every part of the world to minimize uncertainty in projections of global warming. Ultimately Gergis concludes that the study “revealed that recent warming [of 0.9 degrees Celsius since 1960] in a 1000 year context is highly unusual and cannot be explained by natural factors alone.” The full article can be found here.